The new Nucleus Fundraising Package blends donation and donor information from your AMS or fundraising platform with other data sources to not only provide up-to-date analytics on fundraising efforts and goals, but also segment and filter that data to surgically target donors for the greatest impact. What demographics or traits are most prevalent in your most active donors? Which geographical areas donate the most and/or the most often? Which donation packages or campaigns are the highest yielding? Who continues to donate year after year, and who tends to lapse? 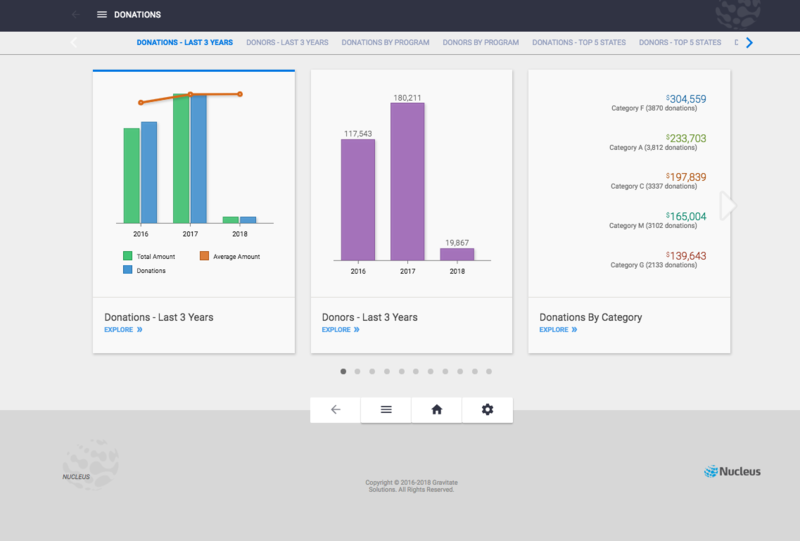 If your organization is interested in more advanced fundraising features, we can help with moves management, or tracking how your fundraising pipeline is doing compared to your goals. With this information in the palm of your hand (literally!) you and your team can track ongoing donations, anticipate trends, and make data-driven decisions for how you manage your fundraising outreach. Best of all, because Nucleus is a site license – not a per-seat license – everyone in your organization can access Nucleus and collaborate using the same source of truth. Reach out for more information about our fundraising offering!